In September 2013 Google replaced their Keyword Tool with the Keyword Planner. The Keyword Planner is a combination of the Keyword Tool and Traffic Estimator. 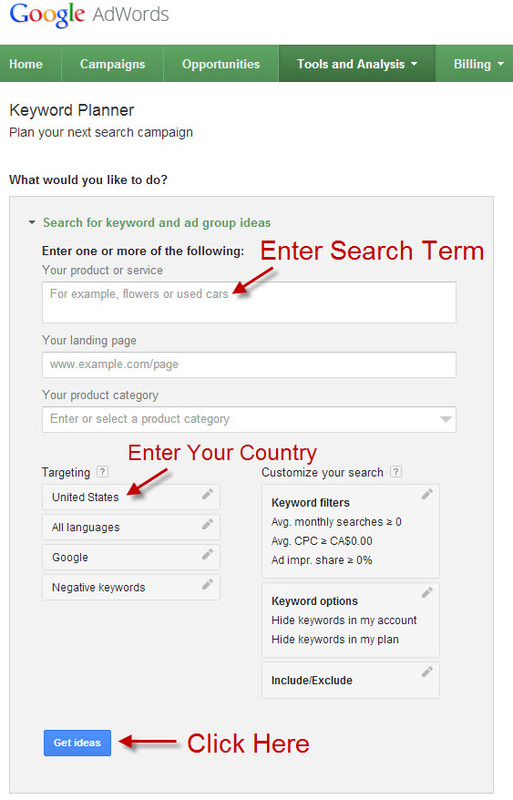 To access Google's Keyword Planner you must have a Google AdWords account. To begin, access Google's Keyword Planner by clicking here. 1. 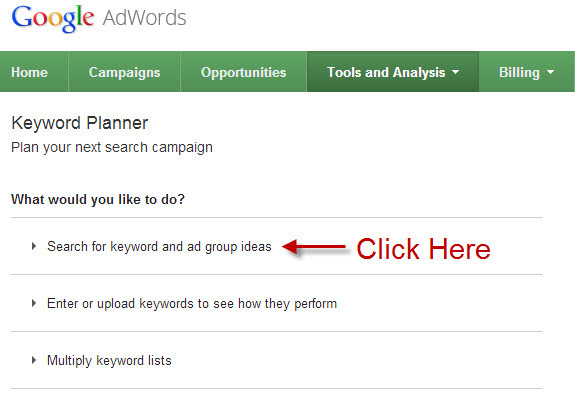 You have 3 options, click on the top one, 'Search for keyword and ad group ideas'. 1. Enter your search term exactly how you think people would type it. 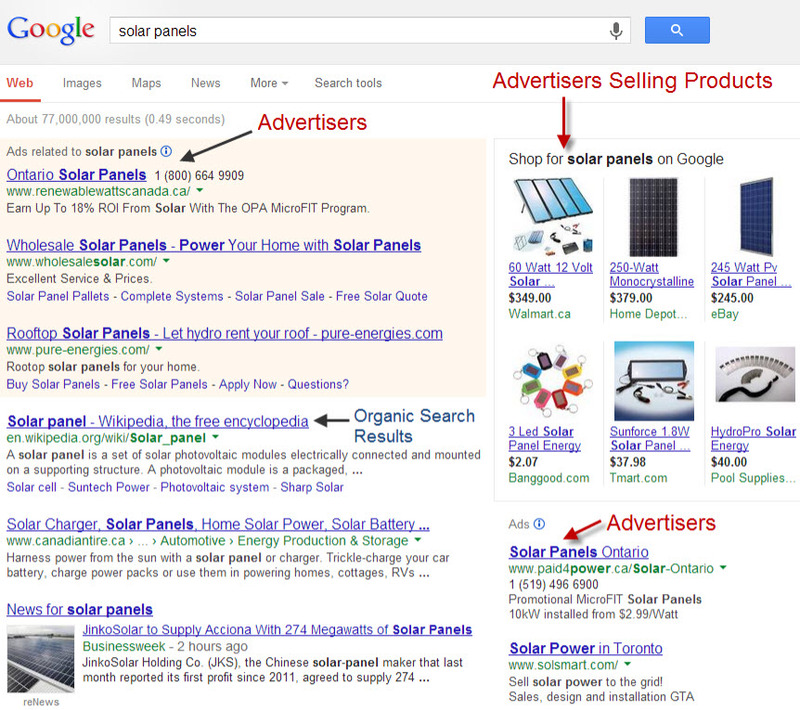 You can also enter multiple search terms such as 'solar panel, solar panels, solar panel quote'. 2. If you want to only see search data from a specific country, city, or region use the filters in the bottom left. 3. Click on the 'Get Ideas' button. 1. Keyword Ideas Click on the 'Keyword Ideas' tab. 1. Avg. Monthly Searches This number is for the exact keyword phrase match and are based on the previous 12 month search volume average, based on the location and language you selected. You can mouse over the graph icon to the left of the number to see how many searches are done in which months. For example, gardening keywords are searched a lot more in the spring. 2. Cost Per Click It shows the Approximate CPC (Cost Per Click) which is an indicator what advertisers have bid for a Google Ad to be clicked on and sent to their website. You can also see which Advertisers are paying for clicks based on this Keyword Phrase. To see which advertisers are paying for their ad to be displayed for the keywords listed, do a Google search for the keyword phrase and look at the the Ads are displayed to the right of the page, and at the top of the Google page in a shaded area, with the word Ads in small grey type. Sneaky. When you click on the ad, it will take you to the advertiser's website, and you will then know exactly who is paying Google to advertise for these keywords.